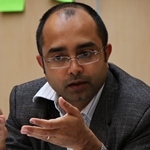 Indrajit Roy is an ESRC Future Research Leader at the Department for International Development at the University of Oxford. He is working on ESID’s project on the Political Economy of the Mahatma Gandhi National Rural Employment Guarantee Act (NREGA). Indrajit’s research interests include democratic theory and the capabilities approach; the politics of the poor; state-society interactions; subjectivity and citizenship; and methodological innovations in interpretive political science. Much of his research focuses on India, but he is interested in developing a comparative perspective on political practices of the poor with other ‘emerging’ economies, such as Brazil and South Africa. Roy, I. (2015). ‘Class politics and social protection: the implementation of India’s MGNREGA‘, ESID Working Paper 46. Manchester. Thapa, R. with inputs from Roy, I., Chopra, D., Sen, K. and Adhikari, A. (March 2015). ‘How commitment and class relations shape MGNREGA implementation in India‘. ESID Briefing 11. Manchester. Roy, I. and Desai, M. (2016). ‘Development discourse and popular articulations in Urban Gujarat’, Critical Asian Studies, 48(1): 1-26. Roy, I. (2016). ‘Emancipation as social equality: Subaltern politics in contemporary India’, Focaal 76: 15-30. Roy, I. (2016). ‘Equality against hierarchy: Imagining modernity in subaltern India’, Contributions to Indian Sociology 50(1): 80-107. Roy, I. (2015). ‘Utopia in crisis? Subaltern imaginations in contemporary Bihar’, Journal of Contemporary Asia 45(4): 640-659. Roy, I. and McCartney, M. (2015). ‘A consensus unravels: NREGA and the paradox of general welfare in India’, European Journal of Development Research 28(4). Roy, I. (2014). ‘Reserve labor, unreserved politics: Dignified encroachments under India’s National Rural Employment Guarantee Scheme’, Journal of Peasant Studies 14(4): 517-545. Roy, I. (2013). ‘Development as dignity: Dissensus, equality and contentious politics in Bihar, India’, Oxford Development Studies 41(4): 517-536. Roy, I. (2013). ‘Contesting consensus, Disputing inequality: Agonistic subjectivities in rural Bihar’, South Asia Multidisciplinary Journal. Chair, Development Politics Specialist Group, Political Studies Association of the UK. Principal Investigator, ‘Lives on the Move‘ project. Convenor, Politics of the Poor MP Year 2 optional module, University of Oxford, Department of International Development. Tutor, Contemporary Politics of South Asia, BA Students, University of Oxford. Associate Editor, Journal of Human Development and Capability Association. *Visit Indrajit’s University of Oxford profile. *View a full list of his publications. You can also read Dr Roy’s commentary on India’s elections at: Hindustan Times, Nottingham University‘s Ballots and Bullets blog, the Hindu Centre, and the blog of Oxford‘s Department for International Development.